Jim Berkland: Major Earthquake in California? #Fukushima I Nuke Plant: Reactor No.5 Is "LIVE"
(UPDATE) 3:53PM JST Yomiuri: The pressure of the containment vessel in the Reactor No.3 has "stabilized"; for now, no releasing of the valve is scheduled. TEPCO has announced that they will try to lower the pressure of the containment vessel in the Reactor No.3. The pressure, which was at 2.8 atmospheric pressure at 1:10AM on March 20, rose to 3.4 atmospheric pressure by 4:30AM. TEPCO will stop the work at the plant to restore power, and stop dousing while they try to lower the pressure. The valve to release steam from the containment vessel in the Reactor No.3 has been open since 8:41AM on March 13. It is not known why the pressure is rising again. TEPCO will try to open this valve again if it is closed. If they cannot open the valve, they will try to open the other valve. There is a possibility that highly radioactive substance may be released if they have to open the other valve, as it will be released without going through coolant (water). Photo by NASA. On the day that a NWO war on Libya started, Japan's nuclear crisis on-going, killing of protesters across Middle East, it looks very appropriate that the moon is blood red. Here in California, we're being hit by a super size winter storm, wind gusting to 60 miles/hour, raining hard. 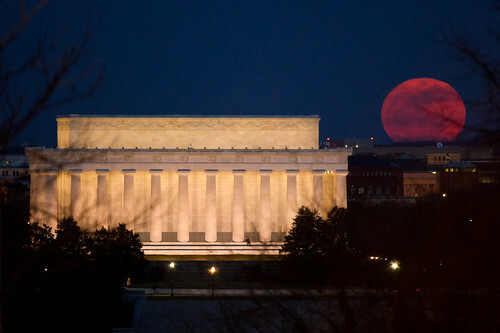 No blood red perigee moon here. Is this some kind of a joke? English language news for doom and gloom foreign media consumption, and Japanese language news for extend and pretend Japanese media consumption? The mission is clearer than the strategy, and that strategy can’t be figured out from the first moves. The strategy might be the imposition of a no-fly zone, the imposition of a no-fly zone and attacks against Libya’s command-and-control centers, or these two plus direct ground attacks on Gadhafi’s forces. These could also be combined with an invasion and occupation of Libya. The question, therefore, is not the mission but the strategy to be pursued. How far is the coalition, or at least some of its members, prepared to go to effect regime change and manage the consequences following regime change? How many resources are they prepared to provide and how long are they prepared to fight? It should be remembered that in Iraq and Afghanistan the occupation became the heart of the war, and regime change was merely the opening act. It is possible that the coalition partners haven’t decided on the strategy yet, or may not be in agreement. Let’s therefore consider the first phases of the war, regardless of how far they are prepared to go in pursuit of the mission. Like previous wars since 1991, this war began with a very public buildup in which the coalition partners negotiated the basic framework, sought international support and authorization from multinational organizations and mobilized forces. This was done quite publicly because the cost of secrecy (time and possible failure) was not worth what was to be gained: surprise. Surprise matters when the enemy can mobilize resistance. Gadhafi was trapped and has limited military capabilities, so secrecy was unnecessary. While all this was going on and before final decisions were made, special operations forces were inserted in Libya on two missions. First, to make contact with insurgent forces to prepare them for coming events, create channels of communications and logistics and create a post-war political framework. The second purpose was to identify targets for attack and conduct reconnaissance of those targets that provided as up-to-date information as possible. This, combined with air and space reconnaissance, served as the foundations of the war. We know British SAS operators were in Libya and suspect other countries’ special operations forces and intelligence services were also operating there. War commences with two sets of attacks. The first attacks are decapitation attacks designed to destroy or isolate the national command structure. These may also include strikes designed to kill leaders such as Gadhafi and his sons or other senior leaders. These attacks depend on specific intelligence on facilities, including communications, planning and so on along with detailed information on the location of the leadership. Attacks on buildings are carried out from the air but not particularly with cruise missile because they are especially accurate if the targets are slow, and buildings aren’t going anywhere. At the same time, aircraft are orbiting out of range of air defenses awaiting information on more mobile targets and if such is forthcoming, they come into range and fire appropriate munitions at the target. The type of aircraft used depends on the robustness of the air defenses, the time available prior to attack and the munitions needed. They can range from conventional fighters or stealth strategic aircraft like the U.S. B-2 bomber (if the United States authorized its use). Special operations forces might be on the ground painting the target for laser-guided munitions, which are highly accurate but require illumination. At the same time these attacks are under way, attacks on airfields, fuel storage depots and the like are being targeted to ground the Libyan air force. Air or cruise missile attacks are also being carried out on radars of large and immobile surface-to-air (SAM) missile sites. Simultaneously, “wild weasel” aircraft — aircraft configured for the suppression of enemy air defenses — will be on patrol for more mobile SAM systems to locate and destroy. This becomes a critical part of the conflict. Being mobile, detecting these weapons systems on the ground is complex. They engage when they want to, depending on visual perception of opportunities. Therefore the total elimination of anti-missile systems is in part up to the Libyans. Between mobile systems and man-portable air-defense missiles, the threat to allied aircraft can persist for quite a while even if Gadhafi’s forces might have difficulty shooting anything down. This is the part that the United States in particular and the West in general is extremely good at. But it is the beginning of the war. Gadhafi’s primary capabilities are conventional armor and particularly artillery. Destroying his air force and isolating his forces will not by itself win the war. The war is on the ground. The question is the motivation of his troops: If they perceive that surrender is unacceptable or personally catastrophic, they may continue to fight. At that point the coalition must decide if it intends to engage and destroy Gadhafi’s ground forces from the air. This can be done, but it is never a foregone conclusion that it will work. Moreover, this is the phase at which civilian casualties begin to mount. It is a paradox of warfare instigated to end human suffering that the means of achieving this can sometimes impose substantial human suffering itself. This is not merely a theoretical statement. It is at this point at which supporters of the war who want to end suffering may turn on the political leaders for not ending suffering without cost. It should be remembered that Saddam Hussein was loathed universally but those who loathed him were frequently not willing to impose the price of overthrowing him. The Europeans in particular are sensitive to this issue. The question then becomes the extent to which this remains an air operation, as Kosovo was, or becomes a ground operation. Kosovo is the ideal, but Gadhafi is not Slobodan Milosevic and he may not feel he has anywhere to go if he surrenders. For him the fight may be existential, whereas for Milosevic it was not. He and his followers may resist. This is the great unknown. The choice here is to maintain air operations for an extended period of time without clear results, or invade. This raises the question of whose troops would invade. Egypt appears ready but there is long animosity between the two countries, and its actions might not be viewed as liberation. The Europeans could do so. It is difficult to imagine Obama adopting a third war in Muslim world as his own. This is where the coalition is really tested. If there is an invasion, it is likely to succeed. The question then becomes whether Gadhafi’s forces move into opposition and insurgency. This again depends on morale but also on behavior. The Americans forced an insurgency in Iraq by putting the Baathists into an untenable position. In Afghanistan the Taliban gave up formal power without having been decisively defeated. They regrouped, reformed and returned. It is not known to us what Gadhafi can do or not do. It is clear that it is the major unknown. The problem in Iraq was not the special operations forces. It was not in the decapitation strikes or suppression of enemy air defenses. It was not in the defeat of the Iraqi army on the ground. It was in the occupation, when the enemy reformed and imposed an insurgency on the United States that it found extraordinarily difficult to deal with. Therefore the successes of the coming day will tell us nothing. Even if Gadhafi surrenders or is killed, even if no invasion is necessary save a small occupation force to aid the insurgents, the possibility of an insurgency is there. We will not know if there will be an insurgency until after it begins. Therefore, the only thing that would be surprising about this phase of the operation is if it failed. The decision has been made that the mission is regime change in Libya. The strategic sequence is the routine buildup to war since 1991, this time with a heavier European component. The early days will go extremely well but will not define whether or not the war is successful. The test will come if a war designed to stop human suffering begins to inflict human suffering. That is when the difficult political decisions have to be made and when we will find out whether the strategy, the mission and the political will fully match up. So the Japanese government was thinking (probably still is thinking?) all along that those Reactors at Fukushima I Nuclear Plant could be somehow resuscitated? Extend and Pretend, supremo, borderline delusional. Banri Kaieda, Minister of Economy, Trade and Industry, disclosed during the March 19 press conference that his Ministry was urged by the mayor of Koriyama City in Fukushima Prefecture that the government and TEPCO plan for eventual abandonment of the plant. When asked about his opinion on abandoning the plant, he answered "Do you think the plant is in a condition to resume operation? There's no one right now who thinks that way," indicating the possibility of abandonment. Hmmm. Was that even a question? When asked about the call for emergency halt of Hamaoka Nuclear Power Plant (operated by Chubu Electric Power Company) in Shizuoka Prefecture, which would be hit hard if a strong earthquake occurs as has been anticipated, Kaieda answered "We are trying to bring gas/petroleum power generation plants back online, but there is not enough supply and we have to avoid large-scale blackout." Another fine bureaucratic speech. Get it? He was asked about Hamaoka Nuke Plant, and he answered by talking about how inadequate the power generation by burning gas and oil is. In essence, he's saying no way to the call for halting Hamaoka Nuke Plant, but never say never, or he may regret later. Mr. Kaieda was famous for his books on how to get rich by investing in risky assets during Japan's bubble era in 1980s. Japan's Self Defense Force started dousing the Reactor No.4 for the first time from their fire engines on the ground, at 8:20 AM. The SDF and Tokyo Metropolitan Fire Department have doused the Reactor No.3 to replenish water in the Spent Fuel Pool. This is the first time to try to do the same for the Reactor No.4. The SDF plans to use 10 high-power fire engines to douse the Reactor with 60 to 80 tons of water. The Reactor No.4 is the one that the US Nuclear Regulatory Commission (NRC) said there is no water in the Spent Fuel Pool. Even though the Japanese government has finally accepted the offer from the US military of 4 unmanned vehicles that can pump water 24 hours without endangering the personnel, they continue the farce of putting the Self Defense Force in front of the news media. The operation for the Reactor No.4 will be the same as the one they did for the Reactor No.3: pretty lame. I'm pretty confident that the US vehicles will be paraded, just for the show, after the radiation is superbly controlled by the SDF and Japanese fire department and Japanese police. The show must go on at all cost. There will be also one of the engines offered from the US military, which will be operated by TEPCO. Around noon, the SDF's CH47 helicopter is scheduled to fly over the plant to measure the temperatures [of the Reactors]. Never mind that the US military has been providing the more detailed reconnaissance data of the plant from the drones to the Japanese government. As I've already said, the show must go on. Obama Family trip to Latin America looks more and more like George W. Bush reading the story of "my pet goat" to primary school kiddies in Florida on 9/11. In a way, it's far more egregious. Bush was informed of the attack in the middle of the reading. Obama has had the situation - Libya, Bahrain, Yemen, not to mention his pet wars in Afghanistan and Pakistan - for weeks, with the last week escalating to frenzy with added mix of the Japanese nuclear crisis. And what does he do? Go on a foreign trip. Just like Bush the Lesser kept reading the story to kids. Did Obama or his handlers ever think of cancelling the trip? Is he thinking of cutting the trip short and head back home? Nope. His handlers want to enjoy Rio, too. Browsing Antiwar.com, looking at headlines. Shaking my head in disbelief that the Prez of the USSA is taking his entire family (the wife, two kids, and the wife's mother) on a trip to Latin America in the middle of all these.. Unreal. I guess this "son of Gaddafi" is as unreal and beyond comprehension just like the "daddy". (Update: 3/20/2011 JST) The SDF started to do the same (lame) operation on the Reactor No.4. See my post. The water from the Self Defense Force's fire engines barely reach the front of the Reactor No.3 building, hardly reach the white smoke rising in the back part of the reactor building. After the dousing, the white smoke starts to rise with renewed vigor. Ministry of Defense thinks it has been a successful operation. CAIRO: Calling Barack Obama as "our son", Libyan leader Muammar Gaddafi sent a message to the US President defending his decision to attack the rebels fighting to overthrow him. Gaddafi (68) also wrote a letter to the French and British leaders, and the UN Secretary General, saying the Security Council resolution was "void" and violated the UN charter, warning them that they would "regret" any intervention. ....Trying to strike a personal note, Gaddafi prefaced his letter saying, "To our son, his excellency, Mr Barack Hussein Obama. I have said to you before, that even if Libya and the United States of America enter into a war, god forbid, you will always remain a son. Your picture will not be changed." Coalition troops fired more than 110 cruise missiles at Libyan targets in 'only the first phase' of a multiphase operation, a senior U.S. military official said on Saturday. Vice Admiral Bill Gortney, director of the U.S. military's Joint Staff, declined to discuss what the next phase of the operations would be. He said more than 20 sites had been targeted in coalition strikes so far. Tomahawk missiles were first introduced by General Dynamics in 1970's, have been in service since 1983. They are now made by Raytheon and Boeing (McDonnell Douglas). It's $569,000 a missile - so we've blown $62.59 million. Quite a firework. Raytheon's stock symbol is RTN (on NYSE), Boeing's is BA (on NYSE). that can pump water CONTINUOUSLY by REMOTE CONTROL, according to Yomiuri Shinbun (in Japanese; 3:04AM JST 3/20/2011). But the Japanese government had to do the grandstanding to show to the foreigners and to the Japanese that they were fully in charge, that what they were doing was what foreigners could have done anyway. "Look at our own brave soldiers and police and fire fighters are saving the plant!" In the process they unnecessarily exposed the SDF soldiers, TEPCO employees, fire fighters, police to high radiation, probably ruined their fire engines with salt water, and exposed the earthquake-stricken Japanese with increasing radiation. All for the show. All the while, there were these US-made engines that can pump water continuously and with remote control. All they needed to do was to ask, or to accept the offer. As I posted in my last post, the Japanese government has had a reconnaissance video taken by the US Air Force drones, ever since March 12; they've been sitting on it. They have thermal imaging of one of the badly damaged reactor from the Israeli company, and they've been sitting on it. What a criminal act that has been, suppressing and/or ignoring the data that didn't come from themselves, refusing the help that could have made a tremendous difference if accepted at the onset of the crisis. It is a crime against humanity. No amount of bowing and crying in the press conference will excuse their bureaucratic tunnel vision in the time of crisis. In the time of the gravest crisis that the nation has faced, these politicians and bureaucrats (I count TEPCO in, as it was a government corporation) have retreated into what they know best - how to be bureaucratic and stickler for the rules and regulations. Sadly, the Japanese people are so docile and so conditioned at this point that it is difficult for them to see that it is the government that kills. Instead, they continue to look to their government to do the right things for them. Just sad. I believe the US military has been flying unmanned drones over the Plant and collecting data. They don't seem to be sharing the data with their Japanese counterpart. Or are they, and the Japanese are simply not telling? Well, it turns out it is the latter. An article in the Mainichi Daily English reveals that the Japanese government has been sitting on the air reconnaissance video taken by the US military drones, even though it has a permission for public release from the US Air Force. Mainichi has this article in English on its English site and the original Japanese article on its Japanese site. However, they are both buried deep somewhere and don't appear on their front page. I happened on the English article by googling "US military flying drones over Fukushima". The Japanese government has in its possession video footage of the Fukushima No. 1 Nuclear Power Plant taken by a U.S. military reconnaissance drone, but has yet to release the footage to the public, sources have revealed. The footage taken from an RQ-4 Global Hawk drone was passed on to the Japanese government with permission for public release from the U.S. Air Force. U.S. military sources said that the decision to release the footage -- or not -- was up to the Japanese government. The unmanned aerial vehicle (UAV) is equipped with a high-performance camera that, according to the U.S. Air Force, takes "footage so clear that even automobile license plates are visible." Nearly real-time footage of the internal state of the power station is said to be captured, which is likely to assist experts in analyzing the situation. The U.S. Air Force has been flying the state-of-the-art UAV based in Andersen Air Force Base, Guam, over quake- and tsunami-ravaged areas since March 12 -- a day after a massive quake and tsunami struck eastern Japan -- in response to a request from the Japanese government. Because Japanese Self-Defense Force aircraft have trouble flying over the stricken Fukushima power plant due to large amounts of radioactive materials detected in the air, the Global Hawk has been filming the area around the clock. Footage is transmitted via satellite to a U.S. Air Force base in California, and is also supplied to the Japanese government. The Japanese government, however, has yet to disclose the footage, which is being analyzed by nuclear power experts and others at the California base. When will they learn? Information, any information, wants to be free. They don't have any prior data to compare the surface temperatures they measured from the SDF helicopter, but that doesn't seem to faze the Defense Minister Toshimi Kitazawa. He seems to be saying that since the temperatures are lower than he feared, the cooling by sprayed water must be working and there must be enough water in the pool now. That's his narrative and he's sticking to it, I suppose. Luckily for him, the reactor didn't blow up while he was speaking. Defense Minister Toshimi Kitazawa announced in the press conference that the temperatures measured by the Self Defense Force helicopter for the Reactors No.1 through 4 were all below 100 degrees Celsius [212 degrees Fahrenheit]. Kitazawa said "The temperatures were lower than we had expected. We believe there is a good amount of water in the Spent Fuel Pool now," indicating he considered the dousing operation by the SDF and fire departments has been effective to some degree, and that the operation will continue. Defense Minister isn't saying how much below 100, though. In the press conference at 4PM, Chief Cabinet Minister Edano said that the Reactor No.3 in Fukushima I Nuclear Power Plant "is stable. Pouring of water into the Spent Fuel Pool has been successful." He continued, "The government will make efforts to improve the situation by pouring water steadily into the Reactors No.3 and 4." He said the government is planning to pour water into the Spent Fuel Pool of the Reactor No.4 by the Self Defense Force. According to the latest Digitalglobe overflight, the situation in Reactor 4 continues to deteriorate. We wonder where precisely in the Reactor 1,3, and 4 wreckage are the working water pumps that are about to be electrified? Far more importantly, since heat appears to be the biggest issue, why have no thermal or IR photos been released to the public, and most importantly why is the Japanese government actively covering up thermal data? "As the world continues to gaze with concern at Japan’s Fukushima nuclear power plant, hi-tech security cameras installed by an Israeli defense firm are recording events at the troubled core from an insider’s vantage point. The Arava-based Magna BSP company, which specializes in producing and installing stereoscopic sensory and thermal imaging cameras, had been contracted to place cameras around one of the plant’s six cores – the core that has been experiencing explosions and overheating. Speaking to The Jerusalem Post on Monday, Magna’s head, Haim Siboni, said the thermal cameras also had the ability to detect the presence of radioactive clouds in the air, but added that Magna had not been able to gain access to the images recorded by the cameras at this time." "Although Magna is able to gain remote access to its computer system, which receives the cameras’ images, Siboni said his company had not yet been authorized to do so. “We have not been allowed to take control remotely yet,” Siboni said." Surely the classified data must be perfectly normal if the completely discredited Japanese government is keeping it under such tight lock and seal. Notice the Jerusalem Post article doesn't specify exactly which reactor's core. It simply says "one of the plant’s six cores – the core that has been experiencing explosions and overheating." Well, which exploding and overheating core? No. 1? No.3? Or No.4? Even that is secret.. I'm not sure if it is a deliberate suppression by the Japanese government, though. At this point, it may be just the sheer incompetence; they simply forgot all about it. No ordinary earthquake, that is for sure. The number of aftershocks since the March 11 Magnitude 9.0 earthquake is unprecedented, and probably not even counting all of them, reports Kahoku Shinpo (in Japanese; 3/19/2011). According to the article, there have been 262 recorded aftershocks of Magnitude 5.0 or larger since March 11. The number is out of the ordinary, compared to other similar big earthquakes in the past that took place along the Japan Trench (a subduction zone). There have been 56 aftershocks of Magnitude 6.0 or larger, which is quite abnormal. Shinichi Sakai, associate professor at Tokyo University Earthquake Research Institute warns of continued seismic activities in East Japan, possibly for years. The article also has this chart of aftershocks Magnitude 5.0 and greater along the Japan Trench, based on the data from Japan Meteorological Agency. The red line is the March 11 earthquake. The X-axis is the number of days since the earthquake, and the Y-axis is the cumulative number of aftershocks. I can't believe he actually left for the Latin America tour in the middle of all this - Japan's nuclear crisis, effective declaration of war on Gaddafi's Libya, US ally Saudi Arabia killing people in Bahrain. Has there been any significant peep out of the US, or from the Prez himself on any of these? NOOOOOO. He issued a statement or two on Japan, silent on Libya, even deader silence on Saudi Arabia. Can't condemn the king who gave him such a lavish gift, can he? Brazil, Chile, El Salvador would have perfectly understood if the White House had said it wanted to cancel the trip, as one grave international crisis was happening after another grave international crisis, and though none of them involved the United States or Latin America directly (maybe with the exception of the UN no-fly zone declaration over Libya) they involved the close US allies and the US's rapid response to these crisis would be critical; therefore the President couldn't leave the country at this juncture. I suspect they had expected that Obama would cancel the trip. But NOOOOOO! It's a family affair! Can't disappoint the wife and two kids, can he? Japan’s Nuclear and Industrial Safety Agency (NISA) spokesman Hidehiko Nishiyama held a press conference on March 17 and again on March 18, in which he shared a rather candid assessment of the situation in Fukushima I Nuclear Power Plant, albeit with high bureaucratic sophistication. In Japan, only Bloomberg Japan reported on his press conference in detail. Major Japanese newspapers only took what they liked to hear - the part he said this had been a humbling experience for Japan and they would strive to solve the problem with international help. In the US, some of his dire remarks were quoted, but not in detail. The gap between what's being reported in Japan and elsewhere is growing alarmingly wider, as I've noticed since I started covering the news of the earthquake/tsunami out of Japan a week ago. It's getting to a point where both cannot be right. Somehow, a Schroedinger's cat has to be found by opening the container. But in this particular case of Mr. Nishiyama's press conference, both the Japanese and the US media reported what they wanted, and stayed clear of what, I think, really mattered in his remarks. Only Bloomberg reported it in length, but it was Bloomberg Japan. Doubly ironic. "We do not know for sure. There is no white smoke." "It is possible that there's no water. But it is also possible that there is water. It is hard to judge." "There is a possibility of hydrogen explosion when water is poured in the pool if there is no water [i.e. if the fuel rods are exposed]. But we have to continue to pour water. The risk of spreading radiation [by hydrogen explosion] has been well considered." "We haven't been informed by TEPCO that it is white smoke (rising from the Reactors)." "The external power line will go to the Reactors No.1 and 2." "At this point, it is not realistic." "Just because the radiation level hasn't dropped materially after the dousing, that doesn't necessarily mean the operation has failed." "It is hard to figure out what it is. We will have to see as we proceed with the operation." "It hasn't been determined whether the smoke is from the Suppression Chamber or not." "There is no explanation that makes sense." "There is such a risk." "We are doing them so that there will be no further expansion of the evacuation zone. 20 to 30 kilometer zone is with ample safety margin. Even if we fail here, the expansion of the evacuation zone may not necessarily happen." Japanese papers report that special fire engines from Tokyo Municipal Fire Department joined the SDF in their effort to contain the Reactor No.3 at Fukushima I Nuclear Power Plant, and they started dousing past midnight on March 19 (Japan Time). And ya think you can put out the nuclear radiation fire with these fire engines? Japanese government agencies keep insisting that the water is hitting the Spent Fuel Pool of the Reactor No.3 and replenishing the Pool. I just can't picture that there is any pool left at all in the Reactor No.3. Can you? (TheWeatherSpace.com) -- Former USGS Geologist Jim Berkland is predicting a major earthquake in California this month. The window starts on Saturday and we are only one day away. The term 'seismic window' has been used by Berkland since the 1970s. Jim Berkland's window starts on March 19th and closes on the 26th. Berkland attributes his prediction on fish die offs, beachings, animal behavior, moon position, and tidal forces. Jim notes this month is "the strongest in many years" for all three. Every day I wake up and hope to find good news on the nuclear plant situation. Every day it get worse. The radiation level that the workers are exposed to at Fukushima I Nuclear Power Plant has started to exceed 100 MILLI-SIEVERT, TEPCO disclosed in the early morning [past midnight] press conference on March 19. As of morning of March 18, there are 279 workers from TEPCO and TEPCO affiliates at the plant. They are fitted with a radiation monitor on them, which sounds alarm when the radiation level exceeds 80 milli-sievert so that they stop their work. However, the radiation level has started to approach 100 milli-sievert, and in some cases exceed 100 milli sievert. Japan's Ministry of Health, Labor and Welfare and Ministry of Economy, Trade and Industry (METI) raised the upper limit of the radiation exposure for the workers at Fukushima I Nuclear Plant from 100 milli-sievert to 250 milli-sievert on March 15. 100 milli-sievert (or 100,000 micro-sievert) is the level which one would start to experience negative effect on one's health. The radiation that you are naturally exposed to in daily life is around 2.4 milli-sievert PER YEAR. The government source said today that the Japanese government declined the offer for help from the US government after the accident at Fukushima I Nuclear Power Plant because "TEPCO said they can do it all by themselves", that it was TEPCO who deemed any foreign assistance unnecessary. According to the government source, the US government offered the US military helicopters for use right after the March 11 earthquake. The Japanese government has been accepting foreign aids only after it thoroughly considers the needs in the earthquake/tsunami-hit areas. Some say the government "did not decline, but put it on hold for further consideration". "Prime Minister, we never "decline" a request from our constituents. We just tell them we will consider their request thoroughly in a committee, then we don't need to do anything..."
Exactly what's happening in Japan. And always blame others. So what they've probably unnecessarily endangered large number of people in the area.? Government kills. I don't have anything more to add. A senior official of the Democratic Party of Japan (DPJ) disclosed yesterday that the Japanese government [headed by their party leader Naoto Kan] had turned down the offer for help from the US government regarding the Fukushima I Nuclear Power Plant accident. According to the official, the US government offered help as soon as the damage on Fukushima I Nuclear Power Plant was known after the March 11 earthquake. However, the US government's offer was based on the premise that the reactor(s) would be killed. The Japanese government and TEPCO believed it was possible to repair the cooling facilities, and probably declined the offer as "too radical". Some in the government and the DPJ point out that if Prime Minister Kan had accepted the US government offer for help at that point, they might have averted the serious current crisis at the Nuclear Plant involving explosions and radiation leak. A similar incident took place in the Kobe earthquake of 1995. 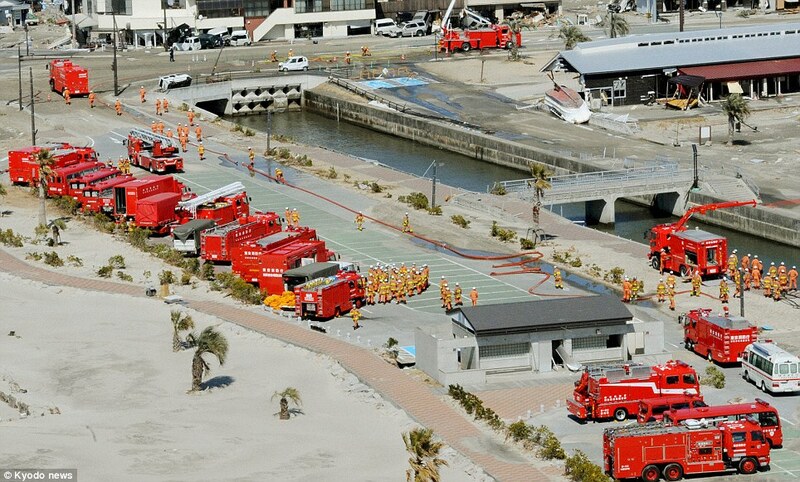 After the raging fire destroyed a district in Kobe, the chief of the fire department in charge of that district faced harsh criticism as he didn't order the fire engines to draw sea water to extinguish fire. His answer? Sea water would have damaged the pumps of his fire engines. I hate to think how many prop desks blew up. And it's specifically on USD/JPY pair. TOKYO (AP) -- The yen fell from historic highs Friday after the Group of Seven major industrialized nations promised coordinated intervention in currency markets to support Japan's recovery from a catastrophic earthquake and tsunami. The G-7 pledge came after the yen hit an all-time high against the dollar Thursday, possibly threatening Japan's exports and hampering its economic recovery from the Mar. 11 quake that triggered an unfolding nuclear crisis. After the announcement the dollar rose to 81.26 yen fro 79.45 yen, but it was unclear whether that was due to government intervention or to traders reacting to the news. The dollar briefly slumped to 76.53 yen on Thursday -- an all time low for the U.S currency and a record high for the yen. Japan's Finance Minister Yoshihiko Noda said the government would intervene in the Tokyo market once morning trading opened Friday. But ministry spokespeople declined later to confirm whether that happened. Noda said the planned intervention was meant to calm "volatility" and G-7 governments had no target exchange rate. And the Finance Minister of Japan thinks it is still the "market" - an exchange of goods/information - when all that's been propping it up is the government's pledge and will to buy up anything to keep it going. Japanese newspapers specifically blame "speculators" for the violent move of yen since the earthquake, rather than more or less normal and rational "risk-off" trades such as carry-trade unwind and repatriation of foreign currency back to Japanese yen by the Japanese companies that operate worldwide. Sad it is that they are going to use the earthquake/tsunami disaster as the financial market "put". They have cancer patients who need chemotherapy. Please ignore the protocols dealing with a sovereign government, and just do it. The government that does not even try to secure the lives of its citizens has lost its legitimacy. Not much different from the Mubarak regime or the Gaddafi regime. Egyptians got rid of the Mubaraks (good for Egyptians), and Brits and French are going in to take out Gaddafi (good for Brits and French). To the hospital doctors, nurses, and workers: How about some good old fashioned way of heating? There are wood debris all around you in abundance. How about some outdoor bon fires? Take your patients out and warm them around the fire. There are but a small number of hospitals in the Tohoku area hit hardest by the earthquake and tsunami. Just heard on Fox News: Pilots of Britain and France will go in tonight. The United Nations Security Council (UNSC) has voted on a resolution authorising a no-fly zone over Libya and "all necessary measures" - code for military action - to protect citizens. Ten of the council's 15 members voted in favour of the resolution, with Russia, China and Germany the five that abstained. It comes just a few hours after Gaddafi warned residents of Benghazi, an opposition stronghold, that his forces would show "no mercy" in an impending assault on the city. "France is very much involved in this action and has prepared the draft resolution. We have one goal… we want to stop the attacks by the Gaddafi regime against civilian populations. "And it's a question of days or hours because the pressure against Benghazi, especially, is now very tough." Screen shot from Al Jazeera Live Feed. LOL. That's what I'm seeing on tweets. Will find a news link when it appears. They are throwing the biggest party ever in Benghazi, says @iyad_elbaghdadi. UK, whose parliamentary system was copied by the Japanese when Japan opened up the country, is neck in neck with Japan when it comes to bureaucratic red tape. BBC reports that 15 UK rescue workers had to fly back home after the British Embassy in Japan refused to issue them one piece of paper necessary for them to work in Japan. I'm sure Sir Humphreys at the British Foreign Office are lamenting the situation but saying sorry rules are rules. UK rescue workers say they had to leave quake-hit Japan because they could not secure the necessary paperwork from the British embassy in Tokyo. The International Rescue Corps said they were not given permission to work in Japan because it would have made the embassy legally responsible for them. The Foreign Office said it was "not true" it was thwarted by red tape. The ICR's Ray Gray and Julie Ryan told the BBC they were disappointed they could not assist with rescue efforts in Japan. After surviving the worst natural disaster in the nation's history, people have started to die because of the government who cannot even deliver the food and water to the officially designated shelters and are too timid or too bureaucratic to ask for help that matters. And to read some of the comments from officials and directors of the hospitals will make your blood boil. Sticklers for rules, and too timid and afraid (or quite possibly, ignorant) of steps that they could take but for which they would have to cut some bureaucratic red tape. The Emergency Response Committee of Fukushima Prefecture announced that total 19 people died between March 14 and 16. They were evacuated from hospitals within 20-kilometer radius of Fukushima I Nuclear Power Plant to the shelter in Iwaki City. 2 of them died on the way to the shelter, and 19 died at the shelter. According to the Committee, they were elderly patients from two hospitals in the evacuation area (in Ookuma-cho), and they were not ambulatory. They were put on a bus and transported to the shelters in Iwaki City including a high school gym. Two patients died on the bus, and 19 patients died after they reached the shelter. Doctors sent by the Prefecture government treated the gravely ill at the shelters, but due to lack of medical supplies and facilities they couldn't do much. In a hospital in Tagajo City in Miyagi Prefecture, 7 patients died by March 17 evening, mostly 80 to 90 years old, gravely ill patients. The hospital's first floor was flooded with tsunami, and there is no water or electricity. The hospital director says "the possibility of the shock from the earthquake and cold (as there is no heating in the hospital) contributing to these deaths is probably not zero." So my biggest question is: WHY DIDN'T THEY (OFFICIALS) ASK FOR HELP FROM THE SDF? The Self Defense Force has helicopters that can transport gravely ill patients. Did they ask? My guess is they never did. The reason they never did, again my guess, is that they knew that the request had to travel the formal chain of bureaucracy, and they knew (as they do this all the time in their line of work) that the request would take a very long time to reach to the top. Yes, to the top or near the top, because the Prime Minister of Japan has asserted his authority to be in charge of everything related to the earthquake/tsunami disaster. Even if they asked, I doubt that the SDF's bureaucrats would have done anything without the order from their boss, the Defense Minister or his boss, Prime Minister. So they put them on a bus in Fukushima, sent them off to a airy, draughty high school gym with little heat, little medical equipment or facilities, and hoped for the best, at best. At worst, they just didn't care as long as they followed orders to evacuate people. Or they just left them there in a hospital with no water and no electricity, and comment after the deaths that the cold may have something to do with it, maybe. So many more will die. Now that the foreign rescue workers may start to leave the country because of the worries over nuclear radiation, the Japanese people are on their own to survive, and that survival is threatened by their own government. #Fukushima I Nuke Plant: More Details of the SDF Operation "Irrigation"
And your heart will sink after you read them. Mine did. It seems almost delusional to me to think their effort made any difference at all, but this is what is fed to the Japanese public as a piece of reassuring news, who remain hopeful that their government's effort will work. I do hope they are right, and I'm the one who's delusional. The Self Defense Force dropped water from their large transport helicopters earlier today (3/17) on the Reactor No.3 at Fukushima I Nuclear Plant, followed by the high-power fire engines spraying water from the ground. Ministry of Defense announced that 5 high-power fire engines that SDS owns sprayed water aiming at the Spent Fuel Pool on the 5th floor of the Reactor No.3. Initially, the SDS had planned to use 11 fire engines connected with the hose that would extend to the sea, but the radiation level was too high to deploy all 11 engines. The dousing started at 7:35PM. The operation ended at 8:00PM, total 30 tons of water sprayed from 5 engines. Ministry of Defense claimed all of the water reached the top floor where the Spent Fuel Pool was located, and it would conduct another round of dousing if requested. In a separate operation, the Police used their high-powered water sprayer [used by the Riot Police to disperse crowds] on the Reactor No.3 around 7:00PM, spraying 5 tons of water in 4 minutes. The water hit the building, but it was not known whether it reached the Pool. The operation was halted as the radiation level was too high. The Police had no further plans to spray water. The Spent Fuel Pool at the Reactor No.3 is designed to hold 1,500 tons of water. If they can fill 40% of the Pool with water (or 5 meters from the bottom of the pool), the spent fuel rods (length 4.5 meters) will be covered. On March 17, TEPCO released the photographs and videos they took around 4PM on March 16 of the Reactors No.3 and 4 in Fukushima I Nuclear Power Plant. Photos are from Asahi Shinbun. The link also has three videos that TEPCO took. The green structure about the middle of the photo is a crane that handles the nuclear fuel rods in the Reactor No.4, TEPCO says. This photo doesn't really show the water in the Pool, and we are to take TEPCO employees words for it that they saw water. I'm afraid it was another grandstanding by the government, to show to the citizens that their government is on top of the situation. TEPCO said in the press conference on March 18 that dousing of the Reactor No.3 at Fukushima I Nuclear Power Plant by the Self Defense Force using the SDF's large [high-powered] fire engines "had certain [positive] effects". The SDF did the dousing 6 times using their fire engines from 7PM to 8PM on March 17. The fire engines were 10 meters (about 33 feet) away from the Reactor No.3. TEPCO had no precise information how much water went inside the Reactor No.3 building, but judging from the amount of steam coming out of the Reactor TEPCO said they believed the dousing was somewhat effective. A heroic scene of the SDF battling nuclear fire only 10 meters away from the wrecked Reactor. Good PR for the prime minister. Earlier, the SDF did the dousing from the air. From the reports in the Japanese media, that was mostly for the show. It endangered the SDF pilots by exposing them to high radiation (though they wore protective gears), but clearly with not much effect and the government abandoned that method. #Japan #Earthquake: Cabinet Secretary Threatens Legal Actions Against "Hoarders"
aka people in Japan in general and people in metropolitan Tokyo in particular, who try to secure the life's necessities like food, water, toilet paper, batteries, toiletries, etc. in preparation for the possible disruption of supplies. Chief Cabinet Secretary Edano [who is praised in an article at Bloomberg for his timely release of information (no joke) and transparency (again, no joke)] warns that the government may have to consider some legal actions against people who hoard. Edano said, "If people just act calmly and rationally and do not hoard, there will be plenty of supplies to the area most affected by the earthquake and tsunami [=Tohoku], helping their lives." Liar, liar, pants on fire! Even the Japanese people now know, amid confusing and conflicting information from the Japanese news media, that there are plenty of foods and water and fuel in Tohoku. They pile up and sit at the official supply depots set up by the local municipalities, and are not reaching the people who needs them. It's not because of "hoarding" that the people in Tohoku are not getting food, water, and heating oil (one person already died from the lack of them). It's because of the bureaucratic red tape, and the bureaucrats' strange determination to carry out orders by the book. And this government official blames people for trying to protect themselves and their families. Get this, people of Japan? The government kills. Don't think it's just governments like Libya's or Bahrain's that kill. Banri Kaieda, Minister of Economy, Trade and Industry, released a statement to the Japanese businesses and people that a large-scale power outage may happen, and there's no way of knowing when or how big. He asked the citizens to further conserve electricity in addition to the rolling blackout. Electricity supply in the area served by TEPCO is 33.50 million kilowatt. However the demand this morning from 8 to 9AM was 32.92 million kilowatt. Mr. Kaieda warned that there may not be enough electricity during the demand peak hours in the evening and at night. The temperature is low on March 17, and there seems to be increased electricity demand for heating. I read somewhere that Russians had said they could possibly provide electricity to Japan from Russian Far East. The offer would be gladly accepted by the people of Japan, even if their stupendously, almost willfully, incompetent government refuses the offer (to save their face and a-s). Japan's Self Defense Force is doing the dousing of the Reactor No.3. TEPCO announced that the Self Defense Force helicopter doing the dousing of the Reactor No.3 saw water in the Spent Fuel Pool on the top floor of the Reactor No.4, and that the water seemed to completely cover the used nuclear fuel rods stored in the pool. There are 783 nuclear fuel rods stored in the Spent Fuel Pool of the Reactor 4, INCLUDING the active fuel rods temporarily removed from the Pressure Vessel, so the temperature of the Spent Fuel Pool of the Reactor 4 is considered to be higher. The Reactor No.3 which the SDF has been dousing with water has 514 used nuclear fuel rods in its Spent Fuel Pool. Steam is rising thick out of the Reactor No.3, and it is feared that the water level has gone down to a dangerous level. The account of the SDF regarding the Reactor No.4 is diametrically opposite the dire assessment of the US Nuclear Regulation Commission. They can't both be right. I hope the SDF is right, and the NRC is wrong. Please just send them to TEPCO, don't bother with the Japanese government. TEPCO, just accept them and start using them, don't bother with the Japanese government. The article by Rudolphe Gelin at Atlantico.fr has to take some obligatory snide comments about why Japan, which boasts of robotic technology, hasn't sent the robot that can deal with the nuclear emergency at Fukushima I Nuke Plant. We all know why, because they haven't got any. They don't even have many functioning emergency power generators! They've been using regular fire engines to try to pump water. French being French, I understand, but please, can't you do without taking a pot shot, for this once? But then Monsieur Gelin says the French company has offered their nuclear emergency robots to TEPCO. Larger models can close valves, cut pipes, and possibly hold a fire hose to get water to the core. I don't quite care how snooty this writer is, please just send those robots and put them to real test. Le Japon est sans conteste la patrie de la robotique, et pourtant ! Seuls la France et l'Allemagne disposent de robots spécialement préparés pour intervenir dans des centrales nucléaires, capables de résister à des taux de radioactivité extrêmes. Henri Proglio, le PDG d'EDF a proposé à l'opérateur japonais Tepco de lui envoyer les robots français. Depuis des décennies, les Japonais font beaucoup d’efforts sur la robotique personnelle, de confort ou ludique, car c’est là qu’il y a un marché de masse, intéressant économiquement. En revanche, ils ont très peu travaillé, voire pas du tout sur la robotique d’intervention, qui restera toujours un marché de niche. Les Japonais se sont dits qu’en cas de besoin, ils iraient acheter des robots spécialisés en Allemagne, aux Etats-Unis ou en France pour s’équiper. Résultat, les robots humanoïdes que l’on connaît au Japon, Asimo de Honda, HRP2 de Kawada Industries, quand on les regarde, on a l’impression qu’ils savent tout faire. En fait, non. Ils ne savent intervenir que dans un environnement très connu et normé avec un logiciel comportemental préinstallé. Les objets doivent être à la place prévue, ce qui est incompatible avec une situation de chaos comme on la connaît dans la centrale de Fukushima, et en plus ils ne sont pas du tout durcis aux radiations. Asimo tiendrait ¼ d’heure à Fukushima, tous ses processeurs seraient en panne aussitôt ! De fait, les Japonais n’ont pas l’équivalent d’un groupe d’intervention prêt à intervenir dans une centrale. Au contraire, après Tchernobyl, s’est posée la question en France et en Allemagne de la pertinence d’avoir des robots prêts à intervenir si un incident nucléaire devait se produire dans ces deux pays proches et équipés en centrales nucléaires. EDF, le CEA et Areva ont donc investi dans un projet qui s’appelle Intra, destiné à bâtir une équipe d’hommes prêts à intervenir, avec des camions et du matériel, sur une centrale en difficulté. Parmi les moyens dont dispose Intra, il y a des robots qui ne sont pas des robots que l’on trouve dans le commerce, mais prêts à intervenir dans des conditions extrêmes. Ils sont spécialement préparés, durcis, pour opérer les missions dont on a besoin dans une centrale en panne. Le mot clef, c’est durci. Les hommes n’aiment pas les radiations, mais la mécanique et l’électronique non plus. Les processeurs, les transistors, toute l’électronique est perturbée par les radiations nucléaires, et cela peut aussi abimer les joints en caoutchouc ou les durites. Il faut donc prendre certaines dispositions pour que ces belles mécaniques ne s’abiment pas trop vite. Il faut aussi les concevoir afin de pouvoir les décontaminer, pour qu’ils ne deviennent pas eux mêmes des déchets après intervention. Ce serait un test en grandeur nature pour ces équipes. Nous, en France n’avons jamais eu d’incident de cette ampleur. Cela permettrait de valider en conditions réelles l’utilisation de ces robots qui contrairement à Asimo ou HRP2 sont téléopérés. On les pilote à distance avec une télécommande et ils font ce qu’on leur dit de faire. Ils pourraient ainsi entrer dans les bâtiments, prendre des images, faire un diagnostic précis de la situation. Les plus gros de ces robots peuvent fermer des robinets, couper des tuyaux, éventuellement tenir une lance à incendie pour aller arroser le cœur. Maintenant, les militaires américains aussi ont des moyens : ils disposent de camions robotisés, qui pourraient aussi rendre une partie du service attendu, et aller arroser le cœur. If you want to see some amusing translation, here's Google Translate. I saw this on live stream earlier today. Someone posted on Youtube. With English simultaneous translation (which is absolutely irritating for a native Japanese speaker, but oh well). Obama's Mouthpiece has nothing to say about Japan and tell the ABC reporter to ask ABC's own correspondents in Japan. Hahahahaha that's rich. But considering his boss has nothing to say about anything other than education, green energy and NCAA tournament, sadly not surprising. JAKE TAPPER, ABC NEWS: "What is going on over there right now? We have not heard the latest information from the NRC or the Japanese government and apparently there has been something that has happened in the last few hours." CARNEY, WH Press Secretary: "Well, it is clearly a crisis. There is clearly --"
TAPPER: "-- what is specifically going on?" CARNEY: "Again, I am standing here at the White House, I think you have reporters in Japan, you have reporters including ones here that could get the technical detailed information on what we know from the NRC, from the Department of Energy --"
"It's up to the media, not the government?" Tapper asked in response to Carney dismissing his question. "No, no I just referred to government agencies that can provide technical information..." Carney responded. As Japan faces potential nuclear Armageddon, we know the Prez of the US is going to Rio with his family. And where is the Secretary of State, in this time of international crisis? She goes to Egypt and Tunisia of course. The snub comes after comments Clinton made as recently as 2009, when she said in an interview with Al Arabiya “I really consider President and Mrs. Mubarak to be friends of my family. So I hope to see him often here in Egypt and in the United States.” Those words–and a perception in Cairo that Clinton was slow to embrace the protest movement–have not endeared her to members of the youth group coalition. Niigata Nippo reports that over 3,000 people have left Fukushima Prefecture and arrived in Niigata Prefecture, and are being housed in emergency shelters in cities and towns in Niigata. As of March 16, there are 3,000 people from Fukushima in 26 shelters set up by Niigata Prefecture government and cities and towns in Niigata. Other cities, towns, villages in Niigata have come forward with their plans to provide shelters for more people. Nagaoka-City has announced it is preparing to house 15,000 people. Niigata Prefecture is also providing the radiation screening for the people arriving from Fukushima at several location. Kashiwazaki Nuclear Power Plant has started to offer informal radiation screening, as the word spread among the Fukushima evacuees that the Plant could do the screening. And the sad, human nature in the time of crisis - there are burglaries reported in Ibaragi Prefecture (just south of Fukushima Prefecture), targeting the houses of the evacuees, as well as swindling money from frightened residents in by making up stories posing as TEPCO employees or fire fighters. France, another country with supreme bureaucracy and politicians who graduated from the nation's top schools for producing such bureaucracy, never disappoints in matching the bureaucratic mess in Japan. (Reuters) - A French parliamentary hearing called to discuss the worsening nuclear crisis in Japan was suspended in uproar on Wednesday -- in a spat over a parked car. As ministers outlined France's response to what the government has called a potential disaster on the scale of Chernobyl, independent member of parliament Maxime Gremetz stormed into a committee room to complain his car was blocked. "That's enough! This is unworthy!," science committee chairman Claude Birraux protested, amid shouts from members of parliament enraged by the timing of the interruption. After disrupting the hearing on live television for a second time, Gremetz was ordered to get the car registration number. "With Japanese people risking their lives today, don't come here and be a pain in the neck with your story about badly parked cars," Birraux said before suspending the session, attended by France's top nuclear and power industry officials. Besson said he was sure the offending vehicle did not belong to him or Environment Minister Nathalie Kosciusko-Morizet. "If it was either of our cars I am sure the chauffeurs would be sitting in the front," he told the committee. Today's schedule of the leader of the free, democratic world. Get up late, meet some government officials and his advisors. Accept award for Sunshine Week. Fundraiser for Dems at night. potentially having no water left in the spent fuel storage pool. I've been looking at the news headlines at major Japanese media outlets in Japanese, and there's none so far that mentions the US Nuclear Regulatory Committee's assessment that there is no water left in the Reactor No.4's spent fuel storage pool. Asahi, Yomiuri, Mainichi, Kyodo, NOWHERE. Possibly under order from the government, lest the populace panic. But all the foreigners in Japan are getting this information. The White House is urging the US citizens in Japan to listen to them, not the Japanese government. over the renewed fear on the Reactor No.4. WASHINGTON — US officials Wednesday warned citizens living within 50 miles (80 kilometers) of a crippled Japanese nuclear plant to evacuate or seek shelter, amid mounting concern of a catastrophic meltdown. The evacuation order came as the chair of the US Nuclear Regulatory Commission (NRC) warned there was no water left in the spent fuel pool of reactor 4 at the Fukushima nuclear plant, resulting in "extremely high" radiation levels. The US set up a much wider no-go zone than the 20-kilometer radius perimeter set up by the Japanese, after US authorities reviewed scientific and technical data about the nuclear emergency. "We are recommending, as a precaution, that American citizens who live within 50 miles (80 kilometers) of the Fukushima Nuclear Power Plant evacuate the area or to take shelter indoors if safe evacuation is not practical," the US embassy in Tokyo said in its statement. NRC chairman Gregory Jaczko told lawmakers that a fourth reactor at the nuclear complex was giving cause for concern following a hydrogen explosion there a few days ago. "We believe that secondary containment has been destroyed and there is no water in the spent fuel pool and we believe that radiation levels are extremely high which could possibly impact the ability to take corrective measures." Yesterday I wrote about Ministry of Education and Science officials telling the reporters to go to the Prime Minister's Office for the interpretation of the data that they collected on the radiation level in the 20-30 kilometer-radius evacuation zone of Fukushima I Nuclear Power Plant. That snide bureaucratic comment was the result of yet another bureaucratic instruction of the chief cabinet secretary. said he instructed the ministries and agencies: "Ministry of Education and Science and Ministry of Economy, Trade and Industry are to collect data only. Nuclear and Industrial Safety Agency (under Ministry of Economy, Trade and Industry) and Nuclear Safety Commission (which belongs to the Cabinet) are to interpret the data. I have instructed to do their job according to their job specifications." And on top of all this, is a clueless Prime Minister without a Sir Humphrey Appleby..